If I had access to a car or motorcycle it would take me 20 minutes – at the most – to go from the center of Sangka to my home. Today it took two hours. Allow me to take you on a typical journey from my front door to Sangka and back. The market in town is 16 kilometers from my house. I know because I used to bike that distance with my GPS only to arrive at the market with a t-shirt soaked in sweat and a full bladder from all the water I’ve had to drink to make up for the sweat. It’s been over a year since I took my bike into Sangka. Now I take a song teeo. A song teeo is basically a small pickup truck with two rows of seats in the bed and a topper high enough to comfortably sit under. It would uncomfortably seat 12 Americans in the back and one in the front with the driver. I’ve counted as many as 31 people loaded in the front, back, hanging off the back and sitting on the roof. The cost is 20 baht (about $0.67). There is no set time schedule for the song teeo. They tell me they run every hour, but what time in that hour is never reliable. I used to arrive at the end of my road at 9 a.m. or 10 a.m. only to wait until 20 to 30 minutes after the hour for my ride to arrive. Now I get to the end of my road when I feel like it. It’s a 15-minute walk to the highway. While waiting on the side of the road, I hope someone gives me a ride before the song teeo arrives. Getting a ride is faster, cooler and free. When the song teeo shows up (usually after a 20-minute wait), rarely is there a lot of room left as my village is one of the last stops even though there’s still 15 kilometers to go. Thankfully, the trucks have a kind-of tailgate meant for cargo, or people. I normally stand on this while holding on to the railing on the topper. Erin sits on the “tailgate”. The ride to Sangka is much quicker than the ride home. The only thing slowing us is the weight of 20 people in the bed of a small truck and poor road conditions in the neighboring tambon. The final drop-off point is the market in the center of town. 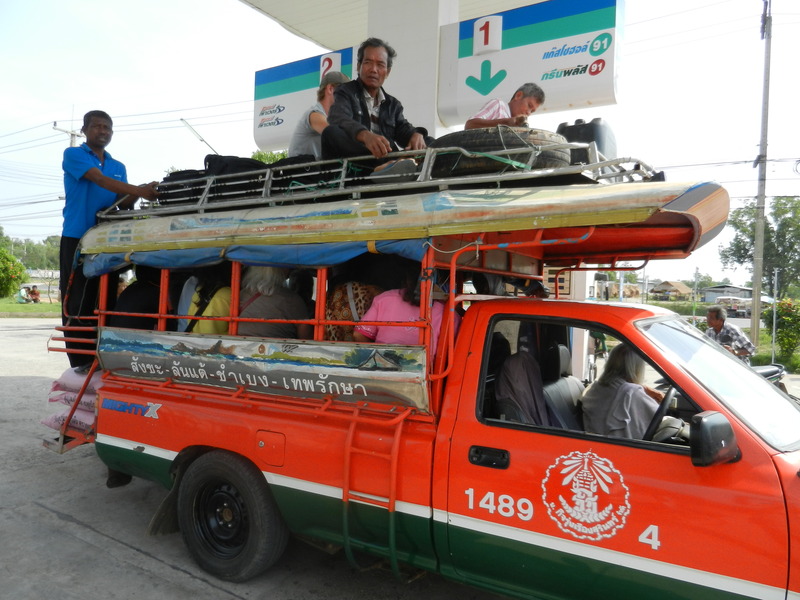 I give the driver 20 baht and go on my way. I get my groceries and various items in need from the market, 7-Eleven and/or Tesco-Lotus Express and walk back to the market where I can see many song teeos waiting to fill up. Since I can’t read Thai, I find the orange and green truck with the number 1489 on the side. There’s usually two of these trucks in the town and one of them will take me home, so I ask either the driver (if he’s in the cab) or one of the passengers in the back if this song teeo goes to ban dta prom, my drop-off point 15 minutes from my house. 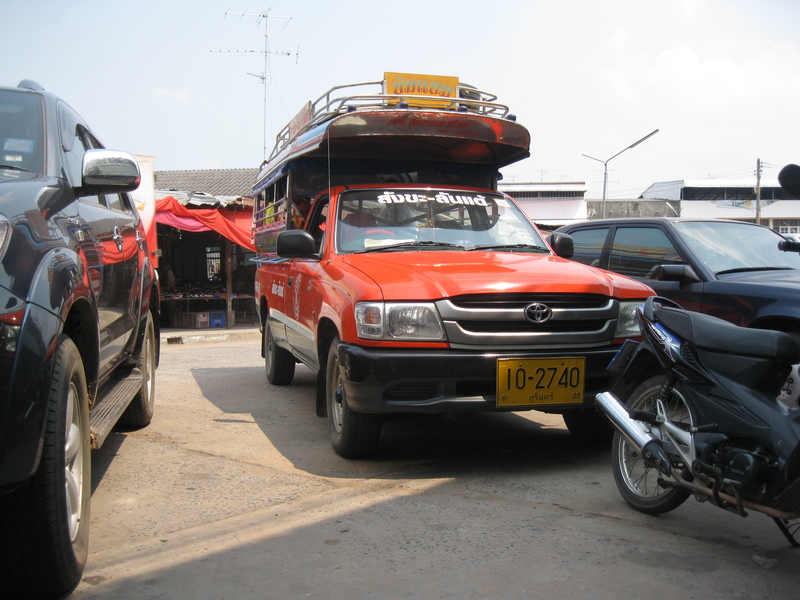 Most of the time the truck is nowhere to be seen and I join the squatting Thais under the shade of a tin roof on the outskirts of the market. It’s a good place to people watch. It’s nice to send back the gift of staring at the Thais. Look full? I’ve been on fuller. Thai men are far from the definition Americans give gentlemen. I do my best to be one and allow all the women, children and elders in the bed of the truck first. This usually leaves me on the tailgate or roof. After loading the back with passengers, the truck leaves. Sometimes it goes in the direction of its destination and sometimes the opposite. This is because the driver is not only paid by the passengers, but by businesses to haul merchandise, most of the time bags of pig feed or rice. As each bag is loaded with the passengers or on the roof, I watch as the bed gets closer and closer to the ground. Fully loaded, the truck’s shell is nearly scraping the road and I fear it overturning because of the top heaviness. While standing on the tailgate the truck slowly drives through a pot hole and I feel like I’m in an Isuzu Samurai on a hairpin curve. The stops for heavy bags number between one and four and a trip home isn’t complete without a trip to the gas station to put just enough gas in the tank to get there. I stand in the shade or stay on the truck at these stops while listening to everyone talk about the white guy with the painted toenails on the back of the truck. By the time I’m finally dropped off, I’ve sweat through my shirt many times over and have been dreaming of urination for hours (public restrooms are very hard to come by in Thailand, especially clean ones). I know I’m close to home when the kids see me, scream “J.J. !” and wave. When I get in my house I check the time and realize my simple trip to town to get a few things has taken three hours or more out of my day. It’s not exactly a quick trip to Target. 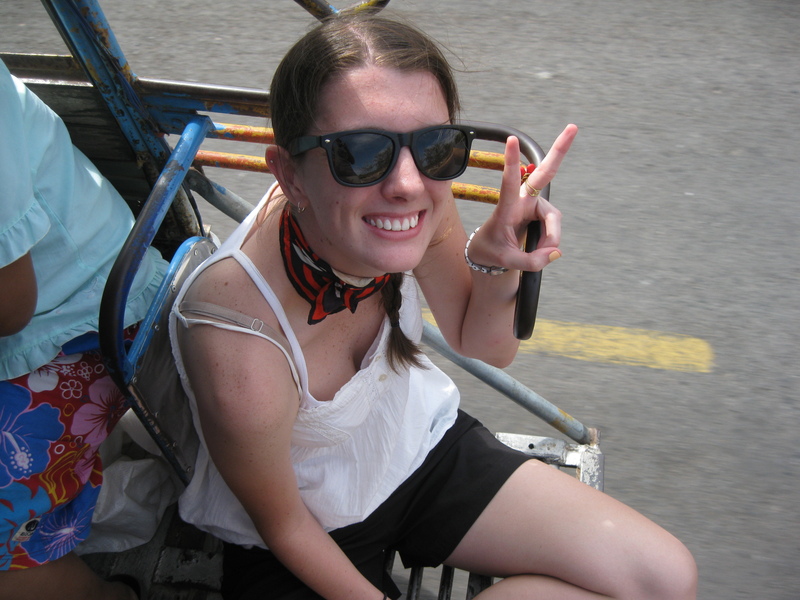 This entry was posted in Peace Corps and tagged peace corps, public transportation, thailand, transportation by Jeff Jackson. Bookmark the permalink.